Here is a tip that may help some of you out there that are working with Windows and Internet Explorer, which can get kind of quirky at times. I don’t know about any of you, but I have found it rather annoying that I can’t download Internet Explorer 6 from Microsoft’s website, other than the online installer that downloads as part of the install. Well, here is a way to use that installer to download the source files so you can perform an off-line installation, which has been useful for me sometimes. From here, click next and watch the files commence to downloading. 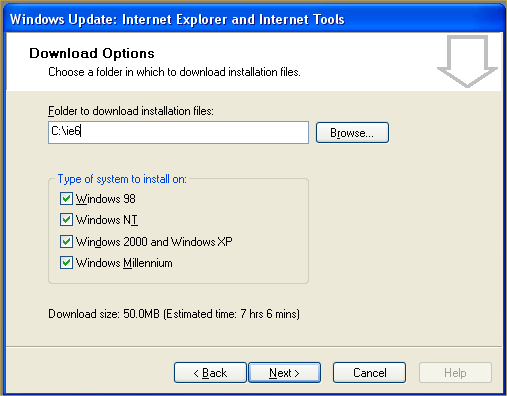 Once the files are downloaded, you should be able to copy the entire ie6 directory to the target computer and then run ie6setup.exe and have it install from the local files, rather than Internet download. Enjoy!